Appropriately, visitors can buy a room 217 keychain in the gift shop and tour the hotel in search of ghosts. And now, once a year, they can watch movies, too — including, of course, “The Shining,” which screened one night outdoors on the hotel’s expansive lawn. But is Stanley’s horror festival merely one more quirky addition to a spooky tourist attraction or does it hold potential as a legitimate addition to the film festival world? Its founders make a compelling case for the latter possibility. While it has plenty of room to grow, the Stanley Film Festival certainly nailed the intimate vibe. “We tried to design it as an adult sleepaway camp,” festival director Jenny Bloom said. Guests milled about the hotel over the long weekend talking shop and discussing genre in between events that included a panel on the secrets of “The Shining” with former Stanley Kubrick assistant Leon Vitali, a whiskey tasting and an awards brunch that featured breakfast burritos served with plastic axes and the word “REDRUM” scrawled along them in sour cream. 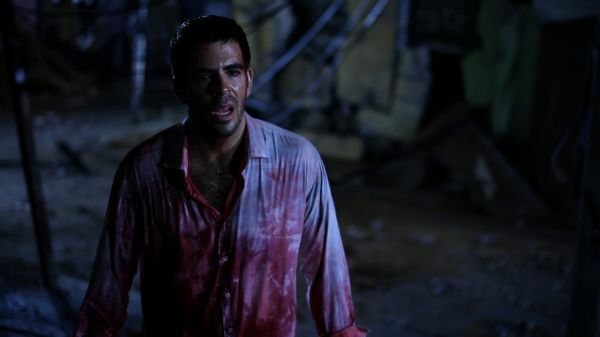 The festival honored indie horror maven Eli Roth, who produced and starred in the twisted disaster movie “Aftershock” that closed the festival. After receiving a shiny silver axe as his prize, Roth roamed the hotel after hours on a ghost tour led by the Stanley’s resident haunting expert, a peculiar but apparently serious-minded woman named Scary Mary. She also led some two dozen filmmakers and other guests on a basement trip the night before — in which this writer was accused of stealing candy from dead children, and the entire group was ordered to sing “Lucy in the Sky With Diamonds” while packed into a pitch black room in order to coax out the hotel’s shyest ghost — named Lucy, of course. Such gimmicks, of course, would hold little value without a compelling lineup of films to complete the experience. The festival had that element down as well. Director of programming Landon Zackheim, a Sundance programmer, assembled a selection that included both hits from the genre world that have played the circuit over the past year, such as Ben Wheatley’s Cannes-acclaimed “Sightseers,” the Elijah Wood-starring remake of “Maniac” and “VHS2” alongside newer entries like the dark Israeli police drama “Big Bad Wolves,” Larry Fessenden’s “Beneath” and the Mexican family possession thriller “Here Comes the Devil.” The international dimension of the program begs comparison to current prominent festivals that focus on horror programming — most notably Toronto’s Midnight Madness section, Austin’s Fantastic Fest and the Sitges Film Festival in Spain. With all those festivals positioned toward the end of the year, the timing for the Stanley Film Festival may help it fit into the current horror circuit over time. Even so, it’s quite the crowded marketplace. For the time being, the only genuine “Sundance of horror festivals” is probably Sundance itself, which has a respectable midnight section of its own. Before the Stanley Film Festival gains national prominence, its founders may have to settle for simply building word of mouth about the distinct atmosphere it offers up. The infrastructure is already there to keep things running smoothly. Bloom pointed out that even as only about two dozen festival staffers worked for the festival during the actual event, they were able to rely on hotel staff for additional help. “Because they have this huge kitchen staff, they’re undaunted by the fact that there might be a couple hundred people to feed,” she said. Additionally, the Chiller network helped out as a sponsor. Lucy the ghost had better get used to the company.